Trafton is the Music Director of the Hagen Philharmonic Orchestra. Conducting a wide variety of repertoire from Haydn, Brahms, and Mahler to Janácek, Hindemith, and Schostakovich, he also often engages with issues of historical performance practice as well as performing world premieres. This season he conducts Mahler 1, Berlioz Symphonie Fantastique, Adams Harmonielehre, Rachmaninoff Symphonic Dances, and Strauss Ein Heldenleben and several operas including Wagner’s Tristan and Isolde. He has previously served as 1. Kapellmeister at the Nationaltheater Mannheim, awarded 2014-15 Opera House of the Year, as well as Kapellmeister positions in Braunschweig and Regensburg. He regularly conducts as a guest symphony orchestras and new music ensembles in Austria, Switzerland, and France. His broad repertoire includes Der Golem (world premiere), La Traviata, Der fliegende Holländer, Il barbiere di Siviglia, Eugen Onegin, Die Lustige Witwe, La Bohéme, Madama Butterfly, Carmen, Der Freischütz, L’Elisir d’Amore, Cavalleria Rusticana, Pagliacci, The Idiot (Weinberg). In addition, he has led numerous projects for youth and familes including Carmen – High School Opera, Stravinsky’s Firebird Suite, Dvorak’s New World Symphony, Mussorgsky’s Pictures at an Exhibition, Ravel’s Ma Mere L’oye Suite, Milhaud’s Le Boeuf sur le Toit and many more. 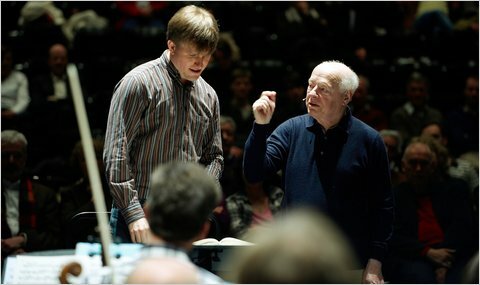 Photo: The eminent Bernhard Haitink gives guidance.